Okay, it's been two months, and I've got nothing. It turns out that I have sold off my last scrap of spare time to exercise. Where I used to cobble this post together out of three or four lunch hours, I've lost that time. Why? Because UCSF was looking for study participants who were mothers of children under 5 who had become more sedentary since having a child. That would describe me exactly. So, twelve weeks of being studied remotely to see if I can keep up on good habits with little or no encouragement. I'm in the control group! But here's the thing: I've always been a good student. Give me an assignment and I'll do it. I may grouse and complain, but I'll get it done. They told me I should increase my daily activity to 10,000 steps a day, up to 12,000 steps a day by the end of the study. That's about 6-8000 more than I get without consciously stopping for exercise in my day, going to ceili, or going to Friday Night Waltz. Basically, it's at least doubling my amount of exercise day by day. And you know what else? Lumping that extra into my day every day takes 30-45 minutes, which it turns out was the last shred of uncommitted time I had in my days. It often means I'm going to bed later than I was before because there wasn't actually an extra 30-45 minutes available in that day. One of the things that's fallen by the wayside is this blog. So I'm here today to say, yes, it's still a priority. But six hours of sleep is the least I function on without dozing off at my desk by 3:30, so it's not getting done right now. I'll try to find a scrap of time somewhere soon, but it doesn't exist today. So, after six weeks in the study, what's changed? I'm taking a lot more steps. I'm getting a lot more exercise. But I've actually gained two pounds. :( And I'm not eating more, allowing myself extra snacks, or anything. It's just... well, it is what it is. If I want to lose weight, I've got to really cut calories, and that means being hungry a lot of the time, and being hungry leads to me being a grumpy person. I told myself at the beginning of this year that I'd had it with that and I was taking a year off. I didn't need to be thin. I needed to be less angry. Next year I can be hungry, but I'm not even going there til after the holidays. Look! 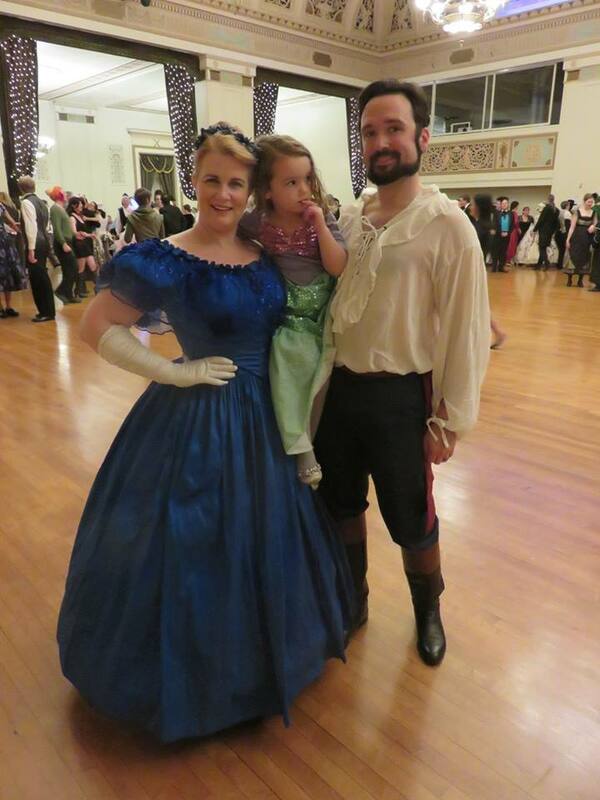 We went to Gaskell Ball! Yay!